People often wonder before committing to eyelash extensions- how do I care for them? Are they high maintenance? 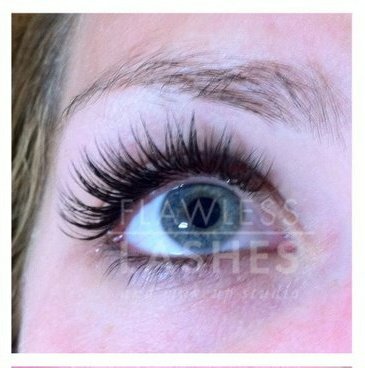 Beautiful eyelash extensions, are they easy to maintain? Here we will learn a little about just how high maitenance are eyelash extensions? What special knowledge or products do I need to keep eyelash extensions looking their best? Most people get eyelash extensions because they are tired of the daily ritual of mascara, and just want to look good right away each morning with no fuss. Some people get them because they still love to wear eye makeup, but want to have that extra something special to make their eyes shine. Either way, it is great for us to know how to best care for our lash extensions so they will wear long and beautifully, since that is what we are paying for, right? There are a just a few things to know about caring for your eyelash extensions. First things are day of application (this applies to first full set appointment, or a touch up). Easy right? So the main thing would be, not to come for lashes the day of a big party or event, because you won’t want to be wearing makeup that same day. 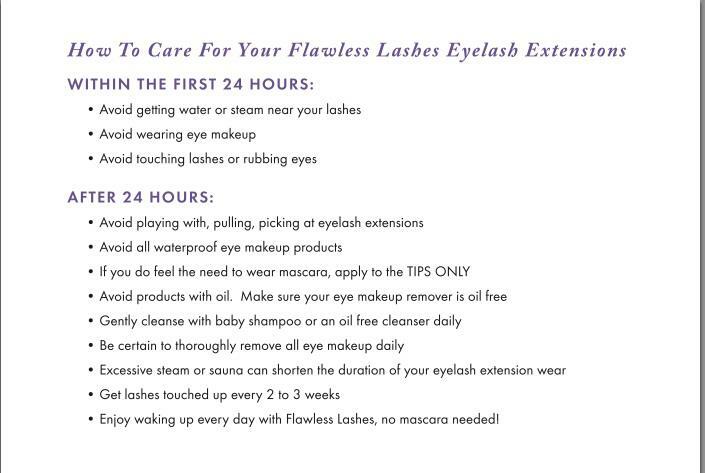 After that, here’s when we get into the finer details of every day wear and care of your Flawless Lashes. Once you learn how to care for your lashes, you will find they are so easy to keep and won’t miss spending all that time applying mascara every morning! The single, biggest mistake people make with eyelash extensions is not cleaning them thoroughly. Most clients are afraid of making their lashes fall out, so they either barely clean by gently fluffing the ends of them with their cleanser, or avoid washing them altogether. Since the extensions are so tiny, people think are too delicate and will fall out when washing. When the reality is, washing them will actually make them wear better and longer. And more importantly- your lashes ( and follicles) will stay healthy and happy. If you avoid cleaning your lashes some bad, nasty things can happen. First being that your extensions don’t stay on because 1) makeup and dirt work their way into the bond of the glue and cause breakdown and 2) likely if you are not cleaning consistently and try to do “one good cleaning” before your appointment there will still be so much dust, dirt, makeup, and debris that the extensions will stick to that, rather than your clean, natural eyelash- causing them to fall off prematurely. Even further what can, and does, happen is the actual follicles of the eyelashes get clogged with debris. This causes the natural eyelashes to be unable to grow appropriately, lashes become finer, weaker, and shorter. When this happens clients will need to scale back the length and volume of extensions or take a break completely, as they get into the habit of cleaning their lashes and allowing the follicles to be open and functional again. After that there is Blepharitis, which is flaky skin in the root of the lashes, in addition to redness and irritation along the lash line. This is caused by not cleaning the eyelashes throughly. I will post a drawing of what it looks like, because photos of the real thing are just not something I want to look at. But feel free to google it if you have a strong stomach. 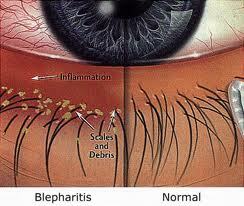 After blepharitis comes eyelash mites. Let’s just say I won’t be posting picture of those, but please know it does happen, it is not a freak thing that only happens to people with horrible hygiene. It happens to people who get lash extensions and don’t wash them. Please don’t make me have to google that for you! So how on earth do I “wash thoroughly” to avoid these problems, but not make my lashes fall out? 1) splash eyes with water. 2) dispense oil-free cleanser or baby shampoo (baby shampoo is if you have already removed eyeliner and/or mascara with oil free eye makeup remover) into your fingers. 3) using your fingers, massage the cleanser into THE ROOT of your eyelashes. I like to take the side of my ring finger and just agitate back and forth. I even clean from below, keeping my eye closed and rub the root of the lashes from that angle. 4) after cleaning all along the lash line very well, splash your eyes with water until all the soap is gone. 5) pat the skin above and below your lashes with a towel, and your lashes will air dry. 6) enjoy how clean and nice your eyes feel! And if there is an eyelash or 2 in the sink, don’t worry! That was likely about to come off any moment anyway. I would rather you have clean eyelashes than 2 more dirty ones on. We lose anywhere from 1 up to 5 eyelashes a day, we just don’t normally notice them. This relates back to the cleaning of them. It is crucial to remove your eye makeup (all of it) every single day. To do so make sure you use an oil free eye makeup remover. If it says “oil free”, but you still have to shake it up, otherwise it is separated into 2 layers, avoid that one. Neutrogena is an offender on this list. We carry an eye makeup remover from Xtreme Lashes that is made for extensions, and some other good ones are The Body Shop oil free eye makeup remover and Chantecaille eye makeup remover. We also carry lint free “q-tips” that you can use with your eye makeup remover that won’t pull or snag at your eyelashes. If you have an oil free face cleanser that removes your eye makeup, you can skip all that and just remove eye makeup, and clean all in one step. Flawless Lashes is currently formulating a product just for this and we will let you know when it is just right and ready for you! Avoid products with oil, such as lash treatments that contain oil, cleansing oils, eye makeup removers with oil, etc. This will only break down the bond of the adhesive causing your lashes to come off. If you wear mascara, please apply it to the tips only. This way it doesn’t get clumped up into the root where the lashes are attached and then it becomes hard to remove. And definitely avoid water proof and water resistant mascaras. They are not eyelash extension friendly. Some brands that are ok with extensions: Xtreme Lashes (we carry in studio), Great Lash, Clinique Extremely Gentle Mascara, Laura Mercier basic mascara, and Full n Soft mascara. If you are going to wear eyeliner- it must NOT be water proof, water- resistant, color-stay, or gel eyeliner. Basically anything that is hard to remove is a problem because of all the important cleansing things we talked about earlier. Some brands that are ok with extensions: Xtreme Lashes pencils (we carry in studio, along with cake eyeliners that we love), Nars eyeliner pencils, most liquid eyeliners (as long as they aren’t “long wearing”, 24 hours, water resistant, etc), and also just using a nice dark eyeshadow smudged along the lash line is a gorgeous way to define the eye without worry of it causing havoc. Other than that some really simple things, like if you sit in a sauna daily, your lashes will not wear as well as someone who doesn’t. If you are a side or stomach sleeper, you may lose a few on your outer corners compared to back sleepers, and when you aren’t cleaning them, just leave them alone and enjoy waking up with beautiful eyes! Beats having to curl lashes, apply multiple coats of mascara, and then worry about it flaking and running, and to top it off- not half as beautiful as Flawless Lashes. This entry was posted in Eyelash Extensions. Bookmark the permalink. ← How long do eyelash extensions last? Of course Bobbi, thank you so very much! I love mine with proper care I was able to wear mine for three weeks! What about sweating during a workout right after getting a re-do?